What A Party and Winners! Thank you to everyone that participated in the Blog Party. What a turnout with 1166 links! I am surprised we didn’t crash Linky’s system. I am always in awe of the talent and creativity I see from other bloggers. I loved seeing all your post and thank you for inspiring me every single day. My giveaway was for a beautiful French script pillow slip donated by Gathered Comforts. I hope you will visit these two very talented ladies and their Etsy shop. The winner of the pillow slip is one of the sweetest ladies in blogland. Congrats to Chari at Happy To Design ! Chari, please email me your address and we will get the pillow slip in the mail. A very BIG THANK YOU to Vanessa and Heather of At The Picket Fence for all the work they put into the party that made it such a huge success. 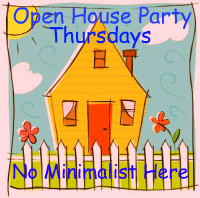 The Open House party is back on schedule and it will ready for you to link up starting Wednesday Evening. Ohhhh my gosh!!! I won!!! I WON!!! My friend, I am elated to be the winner of your sweet and gracious giveaway! I just adore the french script pillow! My wheels are turnin' already…of where I will put this beauty! Thank you, dear friend!!! Sherry, my computer is not set up to be able to just click on your link to get your email. Sorry! If you would email me, I would be happy to get my address info to you! I do apologize for the inconvenience. Ohhh…I'm sooo excited! I just adore this pretty pillow! Thank you again, Sherry! Such a beautiful pillow. Chari is going to love it! Congratulations Chari! Your vanity is gorgeous, Sherry! I can't wait to see it after you've painted it. $65…what a steal!!!!!! What a beautiful pillow..Congrats to you Chari..